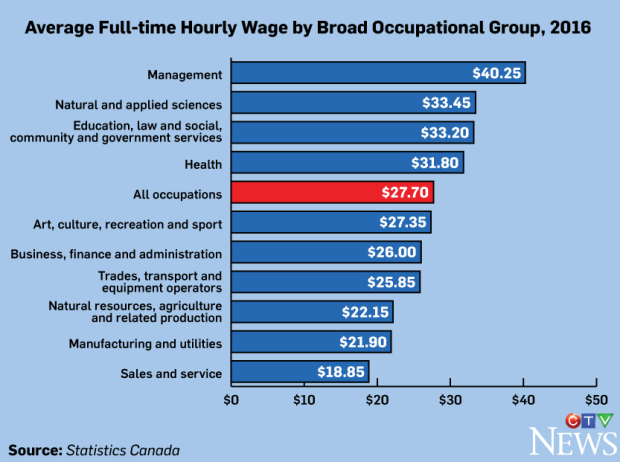 The average hourly wage paid to full-time payroll employees in 2016 was $27.70, with management jobs and the sciences topping the list, according to new data released today by Statistics Canada. Data drawn from the new Wages by Occupation component of the Job Vacancy and Wage Survey was gathered in a survey conducted on 100,000 businesses across Canada, detailing average wages from January to December, 2016. In 2016, the highest average full-time hourly positions were in the broad category of management, which are on average paid $40.25 hourly. There is a broad divide between the top category of management jobs and the second highest ranking natural and applied sciences, with a gap of almost $7 between the two. Conversely, the lowest wages in the country are seen in sales and service occupations, at only $18.85 hourly. However, there is great variance found even within the individual categories, with the highest paid worker in sales and services occupations, the technical sales specialist in wholesale trade, making $32.10 compared to the $11.50 paid on average to bartenders, the lowest paid. Also of interest is the variation seen across Canada. 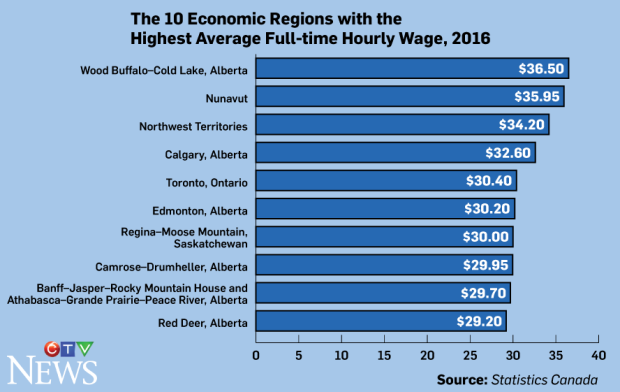 Alberta was a clear winner, with six of the province’s seven economic regions making the list of the nation’s top 10 for highest average hourly wage, alongside Toronto, Nunavut, and the Northwest Territories. In contrast, the 10 economic regions with the lowest hourly wage were located in the Maritimes and Quebec.